No look is complete with out the perfect pair of shoes. 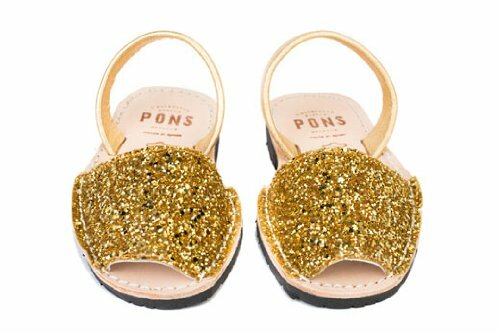 These beautiful sparking shoes will look great with your Anna dress. 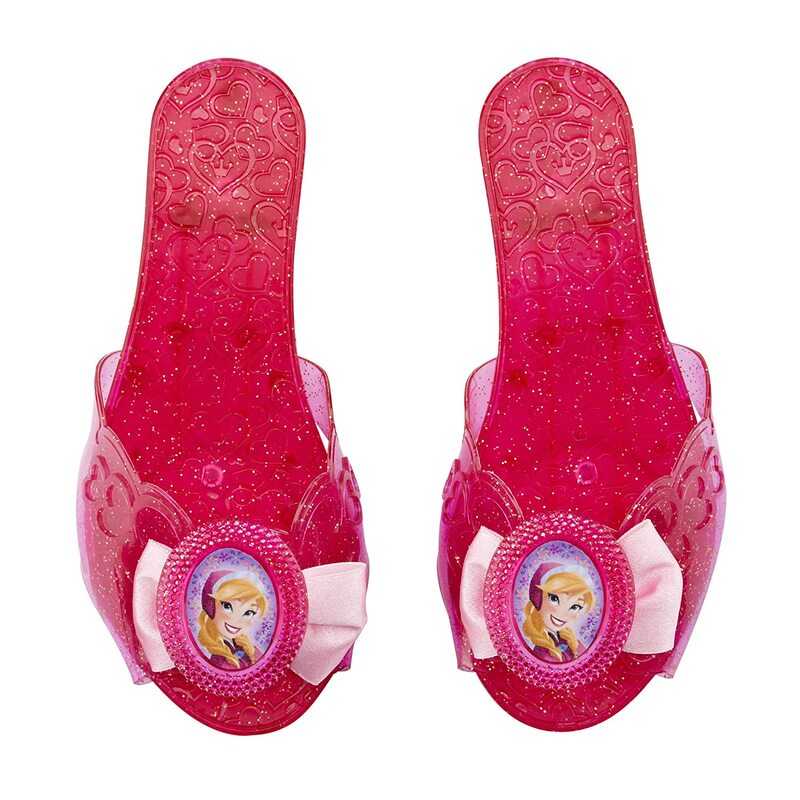 Each shoe in a custom color to match your favorite Frozen sister complete with a cameo and bow to match. 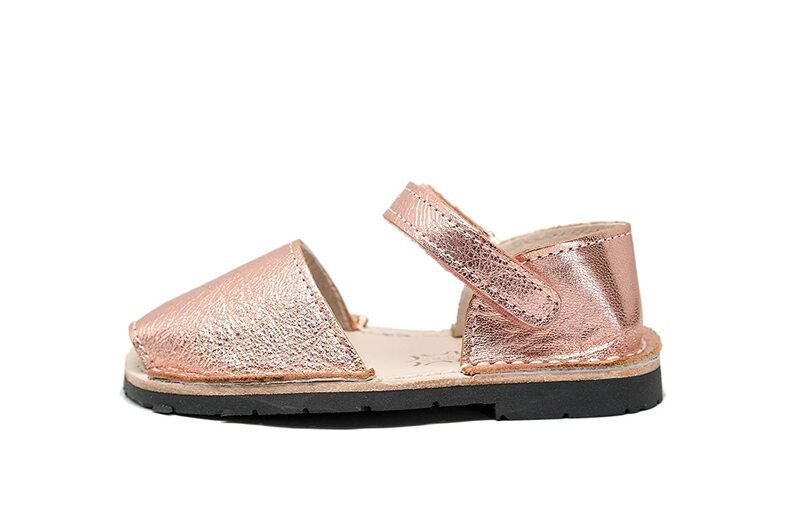 Sparkle and shine with every step. As the mother of a Frozen-obsessed 5 year-old, I must say I've probably spent the equivalent of a down payment for a house on toys, clothes, etc! She just had to have these shoes, but when we got them, we knew right away they weren't going to work. They are way too small for her size 11 feet. Seems to me like they've started making them smaller than they used to because she has other princess shoes that fit just fine. So she's sad and I'm annoyed and the poor shoes will have to go back and maybe some child with tiny feet will buy them and be happy. I would say the biggest size these go up to is 9. So our search for Anna shoes goes on. They do look nice and seem to be good quality by the way, they just don't fit my kid. 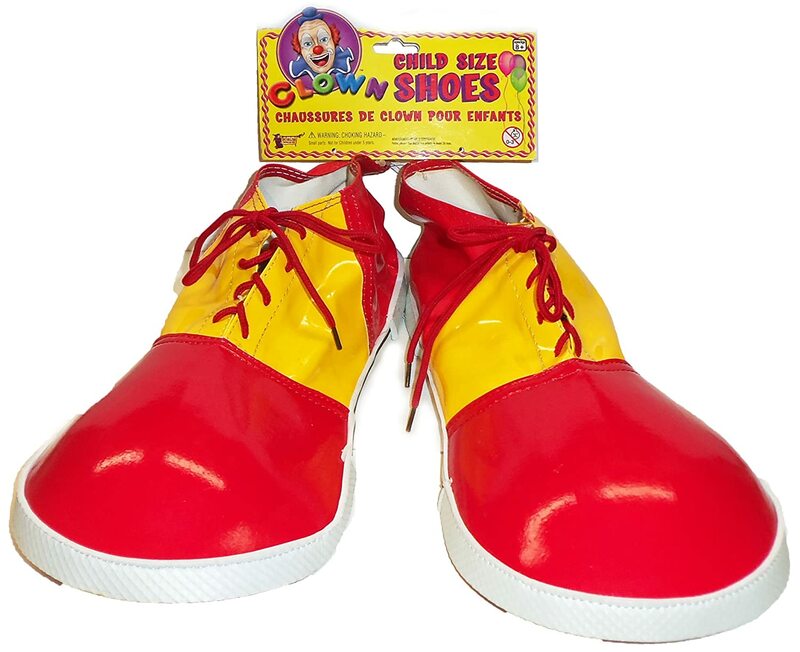 I got these for my 4 year old who wears a 10.5-11 shoe after reading many reviewes that they fit for 5 year olds. My daughter must have big feet because these barely fit. Maybe she could use them for another month or so before she wont be able to get them on at all. These would probably fit kids who wear a 9 or 10. On the plus side, they are cute and my daughter really loved them! True to size. Fun dress up shoes. My girls wore these for years before wearing them out. They went cute with the dress-up outfit. 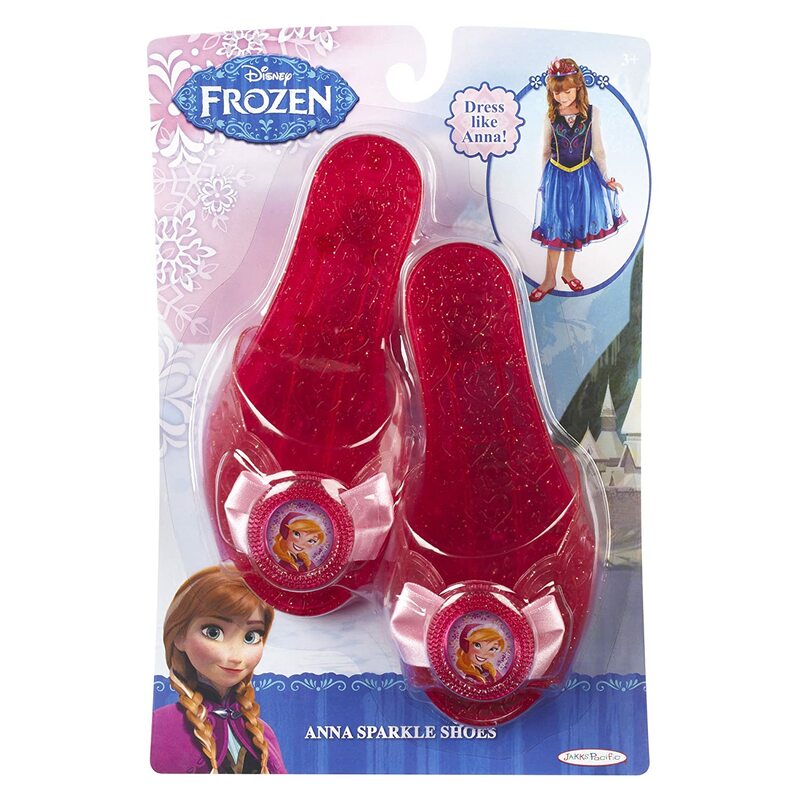 My 5 year old daughter really enjoys her Anna Sparkle Shoes. The plastic is a bit hard, so I thought they might hurt her feet. But so far, no complaints. They make a loud clomping noise which is fun for a 5 year old (maybe less fun for her parents). 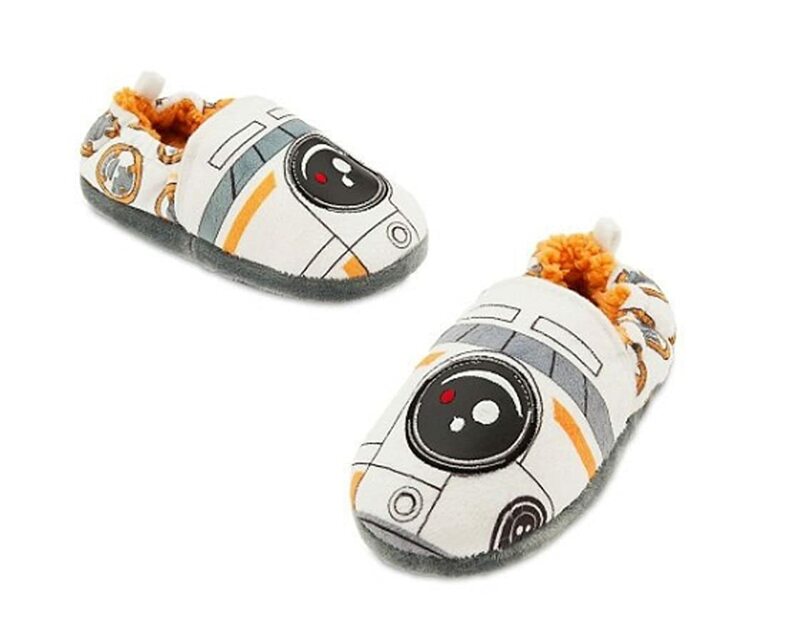 For sizing guidelines: my daughter wears a 10.5 and her feet are a bit wide and these fit perfect with a little room to spare. They are as described seems will made. She has yet to walk on hardwood floors not sure if they are slippery. She likes them. She's 2yrs old and very petite. They are snug. Her shoe size is 6 1/2 toddler. My 3 yr old granddaughter loved these shoes she didn't want to take them off. They went perfectly with her Anna dress and jewelry. I recommend for a child no older than 5 yrs old.